GORHAM—Four different Rams – Grant Nadeau, Ryan Farr, Andrew Rent and Colby Christakis – scored a goal each as Gorham charged past visiting Thornton on Thursday night, Sept. 13. For their part, the Trojans never found a way onto the board. 4-0 the final, then; the result bumped first-ranked Gorham to 6-0 on the season. TA slipped to 1-4; the Trojans sit currently in 13th place. Gorham opened the bout with attacking pressure – and applied much of more of it throughout the game. When TA managed to clear, often the furthest push they could muster stalled at midfield, where the Rams knotted them up. 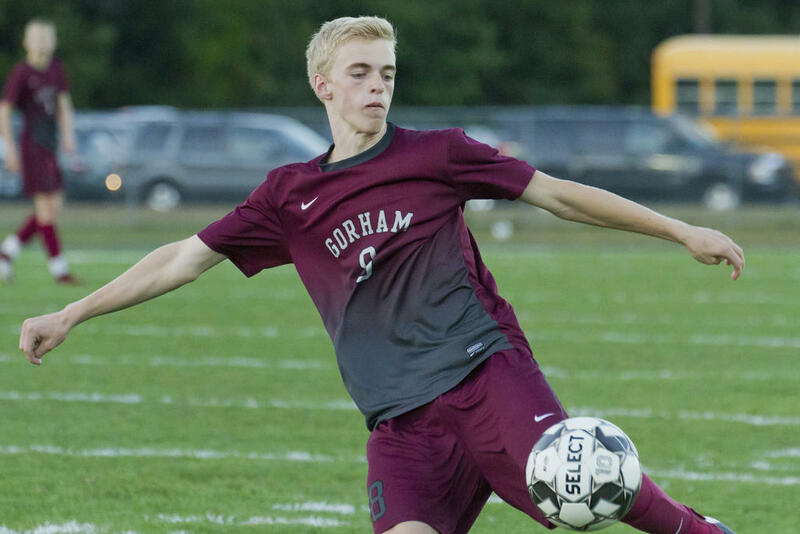 Gorham didn’t play their best soccer in the first 40 minutes; nevertheless, they seized control – and the lead – during the stretch. Thornton didn’t roll over for the Rams, exactly, but the Rams still put the ball in the net. In the 16th minute, Gorham cracked open the scoreboard: Following a Brady King corner kick, Nadeau connected with a rebound and put the Rams’ first point past Trojans netminder Travis Snyder. Early in the second half, Snyder appeared to tip in an own-goal – a turn of events that would’ve pushed Gorham out front 2-0. Snyder leapt after an airborne ball, sailing inward from low on the right side of TA’s zone, and tried to deflect the shot up and over his crossbar; instead, he knocked the ball into the top corner of the net. But the nearest official waved the goal off: He’d blown his whistle a split-second earlier, when the ball wheeled out of bounds. (It wheeled back in again, but that doesn’t matter). The moment failed to deflate the Rams, however. In the fifth minute, for instance, Rent swooped in on a TA defender’s misstep – an attempt to clear straight up the middle, where none of his teammates were awaiting any pass. Rent smashed into the ball, powering a shot ahead, but Snyder proved up to the challenge. In the eighth minute, Gorham finally snagged their second point of the evening. Rent ripped the initial shot, following a throw-in from the right side, but it was Farr who pounced on the rebound and shoveled it home for 2-0. Shortly after that, the Rams hashed a trio more corner chances, one after the other. Brady King took them all, and placed each ball just about ideally – but no luck; his teammates couldn’t generate anything with so many pesky Trojans in the way. With 27:28 still on the clock, though, King took yet another corner kick – and this one went Gorham’s way: Rent, leaping, got a head on it, a redirect that blew past Snyder for 3-0. Finally, with 16:17 to go, Gorham capped their evening. Christakis, moving up the left wing, did the honors, reeling in a Rent feed from near the middle, tapping a low shot across right and besting a diving Snyder. The Rams are – not to jinx anything here – on a quite roll to start the autumn. Gorham opened their schedule with a 5-0 home win over Westbrook (in last place at present, at 1-4); they then won at Deering (11th, 3-2) 4-1; at home vs. South Portland (14th, 2-2) 2-0; at Portland (fourth, 2-2-2) 3-1 – that one was a rematch of last year’s Regional final; and at Scarborough (seventh, 3-1) 4-0. The Rams are presently savoring a week’s rest; they travel to Biddeford (15th, 0-4-1) on Sept. 20. Kyle Hamblen unwinds into a kick for Gorham in their win over TA. Ryan Farr kicked in a goal for the Rams in their 4-0 win over TA. Ram Cooper Lyons takes a touch on the ball. Ram Andrew Rent gets a head on ball. Gorham’s Colby Christakis chases down TA’s Sam Edborg. The Rams confer during an injury timeout. Javin Stickney wheels toward the action. Gorham’s Kevin Mollison and TA’s Cameron Cote face off over an airball. Gorham’s Grant Nadeau gets air over TA’s Alec McAlary in pursuit of a header. Gorhamite Andrew Rent gets a step on a TA opponent. Kevin Mollison settles a ball for the Rams. Brady King presses the attack for Gorham.